IGEPv2 Linux Kernel 3.18.x | Enide! This page describes the process of compiling the Linux kernel version 3.18.12 for the IGEPv2 RC4 board that I own. It includes compilation details not only for the kernel but also for the newer version of U-Boot SPL that doesn't need the TI X-Loader as its first stage loader. ISEE, the company that manufactures the IGEP boards, only provides kernels versions 2.6.35 and 2.6.37 and those are not recent enough to run a mainstream distribution like Debian on your IGEPv2 board with all the security fixes that come out periodically. Disclaimer: The process described on this page works very well for me and didn't destroy my IGEPv2 or my computer, but everything on this page is provided without any warranty. You may download the kernel and U-Boot already compiled on the next section or in alternative feel free to compile your own by following the instructions. 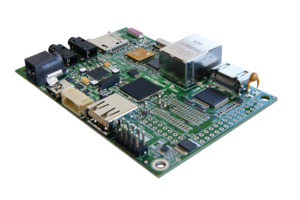 Latest kernel: 3.18.12 with support for samba, uvc + pwc webcams, USB-Serial adapters (FTDI/Prolific) and ACM support (for some modems and Arduinos). Here are the binary files you'll need to place in the boot partition of your SD card and the linux kernel source. You don't need to go through the entire build process unless you wish to add extra features to the kernel. I installed Debian Wheezy using their net-install (link no longer works, see end of paragraph) ISO on a VirtualBox VM with 512M RAM and 10GB HDD to reduce the probability of making mistakes while using the crosscompile toolchain, but it's also possible to crosscompile on a physical system if you have one available. Debian no longer provides a working link to download Wheezy but you can use the newer version Jessie 8.2.0 as well. To get the crosscompiler toolchain, I went to the Linaro website and downloaded their gnueabihf most recent build (at the time of writing): gcc-linaro-arm-linux-gnueabihf-4.8-2014.04_linux.tar.xz which I extracted to /usr/src/gcc-linaro-arm-linux-gnueabihf-4.8-2014.04_linux and included its bin/ it in the search path. Search and comment out any repeated value from the file. The bootloader was cloned from its git repository and then a specific version was checked out because the HEAD on 2015/01 didn't create an u-boot.img that works on the IGEPv2. The revision a176ff0705351bf6d993a8f15e081bfa2ba2e1af works fine (v2014.07-rc4). I'm using almost the same file found on this page but I changed the resolution to 1440x900. I added the omapfb.vram, vram and video parameters to prevent the kernel Oops error on omapdrm.ko due to the lack of configuration on the omapfb.ko (omapfb.vram, vram) and omapdrm.ko itself (video). Save as text file (in UNIX mode) and place it also on build-target. Copy all files from build-target to the boot partition of the SD card. Don't forget uEnv.txt. Uncompress the modules-3.18.12.tar.xz file into the rootfs partition at /. It should write all modules in /lib/modules/3.18.12.